It was a cold day. The kind of day that screams stick-to-your-ribs comfort food. 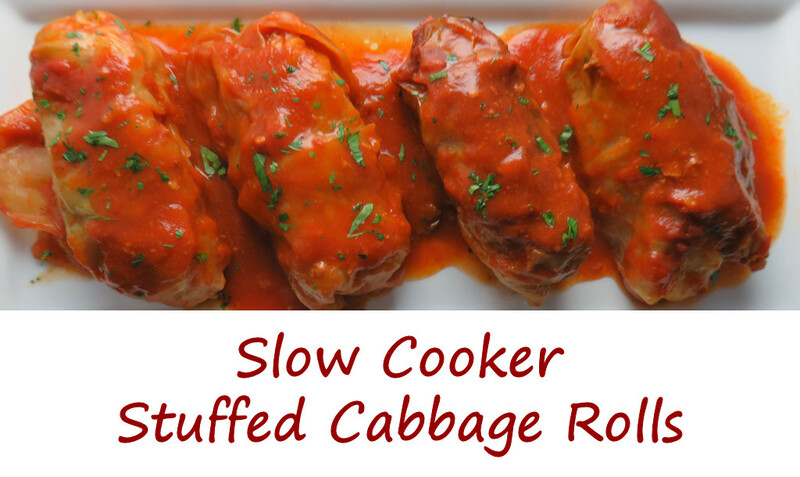 These slow cooker stuffed cabbage rolls hit the spot and then some. They’re pretty easy to make, couldn’t get any easier to cook, and are the perfect cold-day food. Ground pork and beef get mixed with rice and a few spices to make a tender, flavorful stuffing. The rolls are bathed in a wonderful tomato sauce that reminds you of tomato soup (for a reason, since it contains tomato soup). You can’t eat just one, that’s for sure! The next time I make slow cooker stuffed cabbage rolls I might add a bit of heat to spice things up a bit. I’m not sure. They’re mighty good as they are. I am sure I’d double the amount of sauce, though. The sauce is mighty darned good. Also try my roasted cabbage wedges with onion Cajun sauce. Remove the core from the cabbage but keep the leaves intact. Carefully lower the cabbage into the water. Boil for 2 minutes then remove and let cool slightly before gently removing any softened leaves that will come off without tearing, Return the head to the water and continue boiling/removing leaves until you have 12 nice large leaves. Chop any remaining cabbage and use it to line the bottom of your slow cooker. Place the remaining cabbage roll ingredients into a large bowl and combine well. Working in batches, lay out a cabbage leaf and spoon 1/3 cup of the meat mixture into the middle. Roll the leaf up like a burrito, folding the sides in to seal it as you go. Place into your slow cooker, seam-side down. Place cooker on low. Add the sauce (see below), cover, and cook for 8 hours. Let cool 15 minutes before serving with sauce spoon over the tops. This entry was posted in From the Slow Cooker and tagged beef, cabbage rolls, pork, recipe, slow cooker, Slow Cooker Stuffed Cabbage Rolls, tomato sauce by Mike. Bookmark the permalink.